While the temperature doesn’t seem to be rising much in Hamilton, Canada (it’s actually very pleasant lately), I still remember what it’s like to have all of my water weight on the outside of my body. Luckily for me, I will have access to an air conditioner this year. But how did humanity survive so many summers before inventing air conditioning? Modern temperature control is mostly reactive, and based on overpowering nature. For example, when you get into your car after it’s been parked in the sun, the first thing you do is crank the AC. If you are clever, you may try to push the hot air out of the vehicle by opening the windows before engaging the air conditioning. Whether you are clever about it or not, battling with nature is not an energy efficient way of beating the heat. The basics: Objects are heated as the absorb energy. Energy is transmitted from the Sun to Earth via light. Putting something between you and the Sun will reduce the energy that’s transmitted to you. Therefore, you should put something between the inside of your home and the sun. The next level of shading is understanding where the energy goes, if not into your home. Conventional wisdom tells us your black t-shirt is going to be hotter in the sun than your white one because black absorbs more energy. So what you really want is something that doesn’t absorb light to shade your home. Failing that, you can try to keep the blinds far away from the inside of your home as you can, so the heat absorbed by the blinds doesn’t get transmitted to your home. This was well understood in the Southern United States, whose architecture is well known for featuring giant porches. The porches serve the dual purpose of providing a pseudo room with excellent airflow, while shielding the house’s facade from direct sunlight. Obviously the home of some Southern high roller. Look at those porches! But this technique was not reserved for the wealthy. Even small homes could benefit, by pointing your front door East and building out a long awning. Obviously not the home of some Southern high roller. But they are making due! Ventilation serves several purposes. The most obvious is to shuttle hot air out of your house and replace it with cooler air from outside. Another reason is to aid in evaporative cooling, and both of these reasons are linked. Initially, the walls and roof of your house insulate you from the heat of the day. However, as the day wears on, your walls absorb more and more energy. Eventually the walls and roof become hotter than the air outside (feel a tin roof at noon). This energy radiates inwards, heating the inside of your home and everything in it. Since the walls and roof are hotter than the outside air, if the air inside is unable to escape, and given enough time, the temperature in your home will surpass the temperature outside. What makes matters worse, each wall is radiating heat. This means more energy will eventually be transferred to the air inside your home. By analogy, the temperature of a lake will be lower than the temperature of a kiddie pool next to the lake. 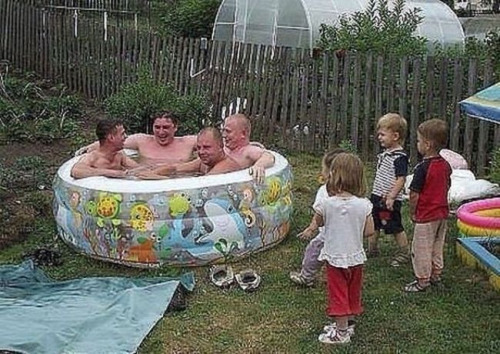 While the lake will absorb energy from above, the kiddie pool will also absorb energy from the plastic walls in addition to the energy from direct sunlight. Additionally, as the molecules of water at the top surface of the lake take on energy, they will pass some off to adjacent molecules, of which there are many. A kidding pool does not have the ability to exchange its water or distribute its absorbed energy very well. The stagnant water – or air – will therefore reach a much higher temperature. As well as distributing energy more evenly, ventilation aids in evaporative cooling. As you and your appliances (like your shower, faucets, etc) sweat, moisture is taken up by the air in your home, increasing the air’s humidity. Increasing the humidity does two things. First, there is a limit to the amount of moisture air can hold based on air pressure and temperature. This means if the air in your home is humid, it will not be able to wick away as much moisture from your body, slowing your body’s best method of cooling. Not only does humidity negatively affect your body’s own cooling mechanism, it also makes it harder for the temperature of the air to be reduced. Based on the composition of an object, different amounts of energy will be required to raise the temperature any given object. This characteristic is known as a materials thermal capacity. For example, water has a high thermal capacity, making it particularly hard to heat. This is why going to the beach is such a good idea in the summer – the lake will stay cool regardless of season. However, this argument works in reverse too. To cool a mass of water at a specific temperature is difficult. Water is said to have a large “thermal mass”, drawing the analogy between heating and cooling to pushing a weight. 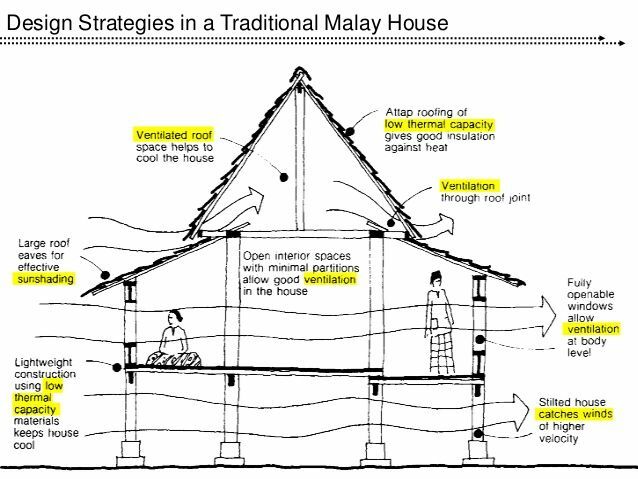 Ventilation is very important to the Malay, an ethnic group occupying locations that are today a part of the modern nations of Malaysia, Indonesia, Brunei, Singapore, and southern Thailand. When hot air is also very humid, it is carrying a lot of energy. Since a significant fraction of the air is made up of water, reducing the temperature of the air will be much harder than if the air was dry. (Now think about why air conditioners spit out water.) So you have two options. You can either attempt to cool this air and all the evaporated water it is carrying (which will be very energy intensive), or with appropriate ventilation, replace the moist air with dry air before cooling it. It is not surprising, then, to see that warm climate architecture all over the world emphasize the importance of airflow. Large breezy windows, open-concept porches and sleeping rooms, as well as artificial wind-tunnels are all strategies that can be found all over the world. Beautiful examples of artificial wind tunnels, or alleys that collect and funnel air through one channel, can once again be found in the American South. Oak Alley plantation, LA. This alley of trees funnels air towards the front of the house, where one will likely find a large porch. Both the “Dogtrot” and “Shotgun” home utilize a unique wind tunnel design to optimize airflow as well. The former having a constant, open channel cutting through the home, and the latter lining up all of its rooms, forcing the breeze to pass through the entire house. A breeze can be channeled horizontally like in the designs above, or it can be directed upward. Since hot air rises, ceiling ventilation like a good cupola make for an airflow that pulls cool air up and shuttles hot air out. Large windows in the protruding “cupola” concentrate and release hot air. This creates a negative pressure in the house, sucking air from outside, in. As we learned above, some materials are considered to have a large “thermal mass”, which means it requires a lot of energy to raise and lower its temperature. This effect keeps lakes cool, humid air hot, and explains why summer homes are often situated near a body of water. Air passing over the water is cooled, and is mercifully delivered to your property. Or even “cooler”, you can just live on the water. This effect can also help determine what materials to construct your house from. Heavy plaster walls, for example, will absorb lots of energy, radiating very little into your home. However, it holds on to this energy, so “night flushing” is required to keep your home cool day-to-day. This process involves keeping your house shut during the day, then opening it up at night to try and pull as much energy out of the walls as possible. This sort of architecture is common in places with large diurnal temperature swings. Iconic Greek architecture using thick, heavy walls. Very cave-like. I’m into it. Alternatively, one can take this principle to the extreme and build walls so thick that they won’t absorb enough heat over an entire season, let alone one day, to heat your home. A very old structure from Mesopotamia. The conical shape also minimizes the surface area to volume ratio, meaning less energy is absorbed or released on the surface compared to the amount of space on the inside. A seaweed roof in Denmark. Not typically known for their brutal summers, a thick roof will also insulate the home in the winter (heat will try to escape from the roof). With the advent of air conditioning, a lot of these techniques are disappearing. In a world unconvinced of climate change, where energy and fossil fuels are so inexpensive, why let nature dictate your architecture? However, these designs could be one part of a low energy temperature control strategy in modern buildings. Coupling these smart designs with energy efficient appliances and air conditioning could represent the next step in human comfort. Or we could all move into caves. That would work too. I vote caves.